So many people across the globe fulfil their life-long dream with us to photograph the Wild White Horses of the Camargue. You can’t beat the adrenalin rush of this noble breed splashing through the shallow waters of the marsh and lakes in their natural habitat. 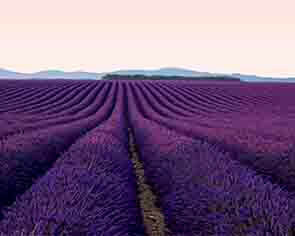 We have combined this workshop with another dream of many – swathes of Lavender fields, like purple velvet, sweeping through the valleys of Provence – it’s a once a year experience not to be missed. Understandably, so many famous artists came to this region to paint endless canvasses of the vibrant colours with such extraordinary light. Capture iconic, award-winning photos with Serge on home soil. Meet at Marseille airport at 14h00. You will be collected from the airport for transfer to your charming hotel in the heart of Provence. Take time to unwind & unpack. After a welcome/briefing meeting late afternoon, we set off for our first shoot to capture a picturesque Village, nestled in the hillside, with the sun setting on its old mediaeval stone. We climb to the highest viewpoint to photograph the rooftops as the sun sets over the village below with its iconic church dominating the horizon. At dawn, we set off for the Plateau to photograph the Lavender fields at sunrise and in the pale morning light, dotted with small stone shepherd’s huts (Mazet) with the Alpilles mountains as a backdrop. We return to the hotel for breakfast and time to relax and download your photos. In the afternoon, we head back to the stunning Plateau, awash with beautiful blue lavender and sunflowers in full bloom – a sight – and scent – to behold! We end the day by capturing the beautiful sunset over the lavender fields. At dawn, we head for the wild and beautiful canyon and lake, described as one of the most picturesque sites in the South of France. On the way back, capture the blue lavender, golden wheat and sunflowers, geometrically aligned in the fields, their borders accentuated by almond trees and the villages in the valleys, stretching out as far as the eye can see. In the afternoon, we return to the plateau to photograph a single abandoned Mazet set on a sweeping hill of Lavender, as the sun sets. In the morning we take a panoramic view of the village at sunrise and then photograph the narrow streets with cobbled stones and pretty squares as well as the mini-gorge with small waterfalls and medieval houses. Check out of the hotel and depart for the Camargue. Check in to the hotel and take time to unwind and unpack. In the morning, a unique opportunity to take exceptional portrait photos of the White and Black stallion in an indoor environment, against a moody back-drop. We use both lighting and natural daylight to capture the stallions dressage-style and rearing in front of the camera. Late afternoon we photograph the iconic Wild White Horses running through the marsh and heading straight towards your cameras. We shoot several drives with the horses running across your field of view! We will also take shots of the ‘Gardians’ (Camargue Cowboys) dressed in their traditional Camargue shirts & hats, trident in hand, surrounded by the herd as well as some close-up portraits of these ‘weathered’ ranchers. At sunrise, we have another session with the horses running together through the shallow waters of the lakes. After the action, we take portraits of the horses on their own or in small groups. 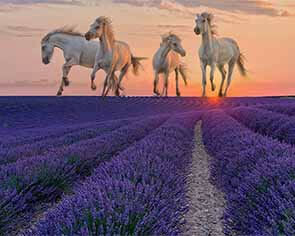 Late afternoon, we have the final session with the white horses running through the marsh until sunset. We will also capture the ‘Gardians’ at work herding the wild horses. For the final shoot, we photograph the sparring stallions – this is a unique opportunity to see the White Horses entwined at full height, in feisty temperament with their manes flying. Afternoon departures from Montpellier airport.